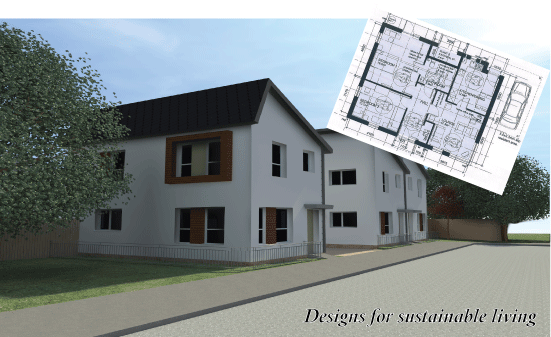 () was formed to meet the significant challenges posed by global warming and the growing demand for affordable green housing - housing which meets new green regulations (Code 6) due to be mandatory for new-builds from 2016. is now able to offer, for the first time, a unique patented system providing low cost - green tech (LCGT) housing with no price premium as opposed to conventional (Code 3) builds. This new system is based on pre-specified factory-made structural insulation panels (SIPs) which are suitable for buildings of up to three storeys. The panels are rendered on site and finished to customer planning requirements, e.g. brick, stone, or render. also supplies green energy solutions for incorporation in to the basic system - solar/PV panels, geothermal, wind turbines, biomass and rain water recycling. 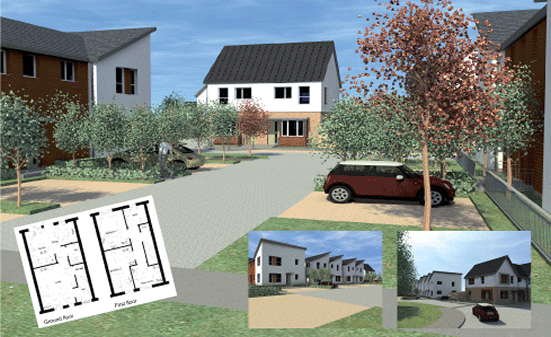 Code 6 and cost: Houses can be constructed to “Sustainable Housing Code 6” (and commercial buildings to “BREEAM” standards), with no cost premium against conventional builds. Timeline efficiency: Construction build times can be reduced by an average of 40% (and the erection process can be largely de-skilled). Proven, reliable, durable: The System is the safe and reliable solution - based on a modification, adaptation and combination of existing, proven techniques and technologies. Choice of exclusive finishes: A full range of “cloned vernacular” finishes are available to meet customer requirments, planning compliance and environmental fit. houses look and feel like conventionally built and finished houses. The secret’s in the structure: The System is based on the superior thermal (and acoustic) efficiency of the structure itself. Its green credentials do not rely solely on the incorporation of micro-generation and other green technologies, as these are incorporated and operate more efficiently within the structure. Modular, not podular: The system and the 29 approved designs currently available are extremely flexible, allowing ample scope for modification and incorporation of additional design features. Customers can choose from several levels of completion and customisation. Carbon Footprint: This is much reduced, due to the nature and speed of the erection process, and the materials used, which have lower levels of embodied energy. Designs: There are currently 29 striking “designs for sustainable living” - from a one bedroom apartment to a six bedroom detached house. All incorporate the essential flexibility that architects, designers, planners and ultimately customers require.